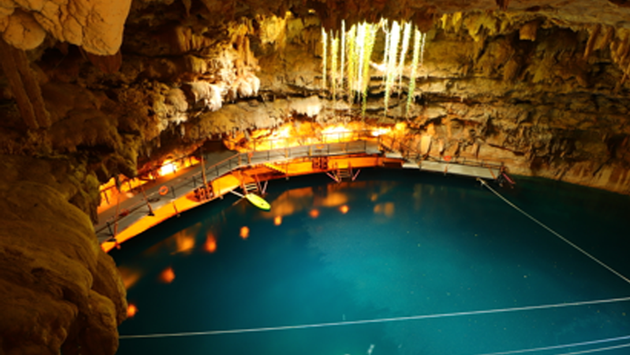 Aventuras Mayas, the leading tour operator in Mexico’s Riviera Maya,announced today the opening of Hacienda Chukum, a new adventure travel destination near Valladolid, Yucatán with a 130-foot cenote (sinkhole) named Chukum-Ha. Named after the surrounding chukum trees indigenous to the area, the park features a number of adrenaline-filled activities for visitors, an open-air restaurant with local Yucatán cuisine, and a gift shop full of locally sourced artwork and souvenirs. The newly developed hacienda will serve as a must-see stop for travelers either visiting the charming colonial town of Valladolid, or on their way to the Mayan ruins of Chichen Itzá and Ek-Balam from nearby vacation destinations like Cancun or Playa del Carmen. “By developing Hacienda Chukum, we’re continuing Aventuras Mayas’ overall mission to promote the cultural and natural resources of Mexico through sustainable, unforgettable adventure excursions,” said Ricardo Díaz, project director of Aventuras Mayas.